MARSEILLE, February 12th, 2019 – In 2018 the mobile games industry reached the legal age of 21 years. Growing from zero to 53 Billion US$, according to Newzoo, mobile games popularity is a worldwide phenomenon. One of the industry’s most spectacular success stories is Angry Birds, which is set to celebrate its official 10th birthday in December. 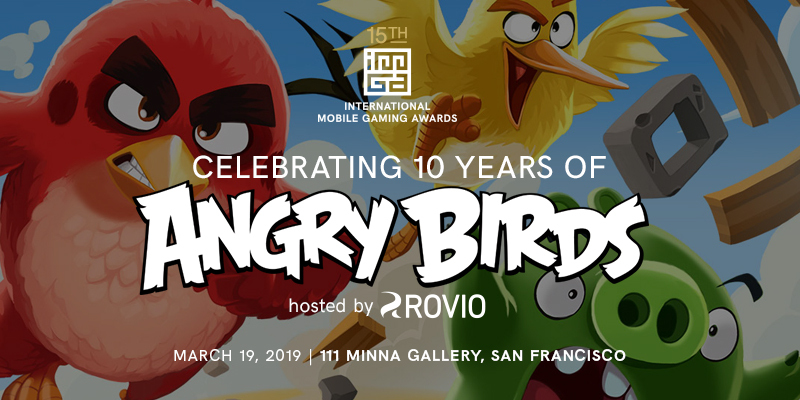 Today Rovio Entertainment and the IMGA announce that they will toast a decade of Angry Birds and the 15th anniversary of the IMGA. In San Francisco, on 19th March, at an invitation-only event, the IMGA will announce the winners of the 15th IMGA. The ceremony will be followed by the After Party, themed around a 10th anniversary celebration of Angry Birds. “10 years ago I have played an early build of Angry Birds, a game which was immediately nominated for one of the Awards. I feel fortunate that we were one of the first to play the game before it became a worldwide success. Today I am proud that Rovio will celebrate the 10 years of their success with us.” Says Maarten Noyons, founder of the IMGA. The IMGA is the longest standing mobile games award program started in 2004. With its long history and unique judging process, it has recognized some of the world’s most popular titles in their early days. It is the only competition that unites the industry by celebrating excellence and innovation in games. (www.imgawards.com). Maria Montagu maria@imgawards.com or call: +33 966 883 199.